Minister of Financial Services Ryan Pinder said last week that the financial services industry, and specifically the developments in what is regarded as international best practices in international financial services, has caused for increased compliance requirements on institutions and clients. 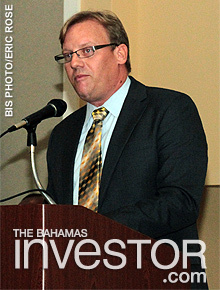 “The lawyers here today have had to advise their institutional clients and industry clients on the evolutions that are required,” Minister Pinder said at the Higgs and Johnson Annual Client Seminar, held at the Sheraton Nassau Beach Resort September 26, under the theme: Riding the Waves of Change: Compliance, Confidentiality and More. Higgs and Johnson Corporate Services Ltd, First Bahamas Title Insurance Agency and Higgs and Johnson Fiduciary Services Ltd sponsored the event. Minister Pinder noted that compliance is now extending beyond money laundering matters that has had the focus of the last decade and now into international tax compliance matters. The Foreign Account Tax Compliance Act (FATCA), he said, is the first step where we see the requirements of additional compliance with respect to tax matters. “This will cause the government, and specifically the Ministry of Finance, to be the competent authority in transmitting information to the Internal Revenue Service (IRS),” Minister Pinder noted. The private sector, he continued, will still be responsible for the gathering of information and the adequate compliance and due diligence, but will not have that added responsibility of sending it directly to the IRS. “As a result of the FATCA and aggressiveness of the United States in this regard, we see momentum internationally for multilateral agreements on automatic tax exchange, which will naturally result in increased compliance obligations,” he said. The Bahamas recently participated in the 20th Session of the United Nations World Tourism Organization's General Assembly held in Zambia and Zimbabwe. Watch a ZNS Network news report here.